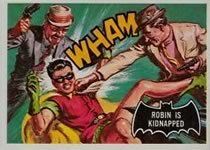 This is the first in a series of posts which will introduce and document the different mainstream sets, and their variations, of Batman cards available. 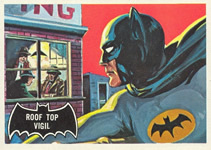 In 1966 the world was introduced to 22 different variations of Batman cards through the production of six different sets (each with several variations). 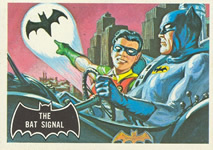 This post will look at the famous must-have cards: 1966 Black Bat cards. 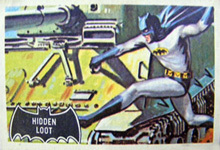 The set features 55 cards of color drawings along with a storyline to match on the back. All variations use identical imagery with only subtle differences as you'll see below. 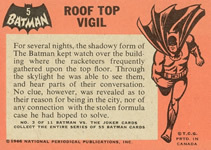 The cards are distiguished from other 1966 drawn Batman cards by the black bat image on the front. The bulk of the illustrations were illustrated Norman Saunders from pencil drawings by Bob Powell. This set was produced by Topps for the USA market. It has an orange back which states "Copyright T.G.C PRTD U.S.A". Below are two front and back examples of the Topps Black Bat cards. 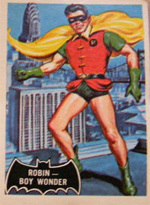 This set was produced by O-Pee-Chee for the Canadian market. It has an orange back which states "Copyright T.G.C PRTD in Canada". 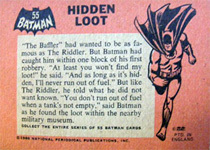 Below are two front and back examples of the O-Pee-Chee Black Bat cards. This set was produced by A&BC for the UK market. It has a pink back which states "Copyright A&BC PTD in England". 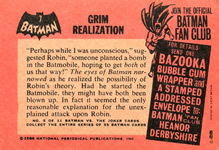 The Black Bat cards produced by A&BC are slightly smaller than other cards of this year. 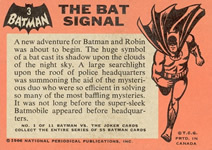 Below are two front and back examples of the A&BC Black Bat cards. This set was produced by A&BC for the UK market. It has a pink back which states "Copyright A&BC Printed in Great Britain " along with the fan club panel enticing the owner to join the Batman Fan Club. 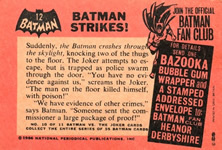 As with the standard issue A&BC Black Bat cards, these are slightly smaller than other Black Bat issues. 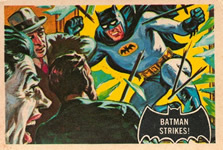 Below are two front and back examples of the A&BC Black Bat Fan Club cards. This set was produced by Scanlens for the Australian market. It has an orange back which states "Copyright T.G.C PRTD in Australia". As yet I don't have scans of these cards available but am hoping to add the set to my collection soon - I'll be sure to add scans as soon as I have them. If you own some of these cards and would like to contribute scans just drop me a line. 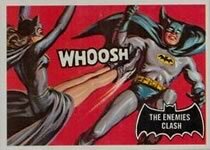 Coming off the popularity of the 1989 Tim Burton film Batman, Topps reissued these cards. 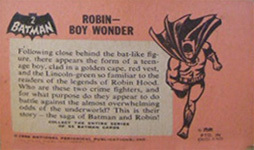 The cards are the same as the Orange Back Topps Series in every way with the addition of "1966 Deluxe Reissue Edition" stated on the back of the card. These cards are readily available for sale online and don't cost a fortune to own. Given their age it can be hard to track down mint copies however good to excellent condition copies are abundant. Centering is often poor due to the technology of the day however I don't feel this detracts from the cards appearence - moreso a reminder of the age and history of the sets! 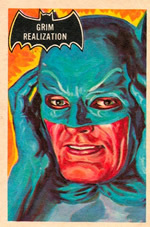 Check out the link below for plenty of connections to Black Bat Batman cards for sale on eBay right now.